What is the value of missing information when assessing decisions that involve actions for intervention? Most decision support models in the medical domain provide a prediction about a single key unknown variable, such as whether a patient exhibiting certain symptoms is likely to have (or develop) a particular disease. An interventional action is one that can be performed to manipulate the effect of some desirable future outcome. In medical decision analysis, an intervention is typically represented by some treatment, which can affect a patient’s health outcome. Counterfactual analysis enables decision makers to compare the observed results in the real world to those of a hypothetical world; what actually happened and what would have happened under some different scenario. The method we use is based on the underlying principle of Value of Information. This is a technique initially proposed in economics for the purposes of determining the amount a decision maker would be willing to pay for further information that is currently unknown within the model. The type of predictive decision support models to which our work applies are Bayesian networks. These are graphical models which represent the causal or influential relationships between a set of variables and which provide probabilities for each unknown variable. The method is applied to two real-world Bayesian network models that were previously developed for decision support in forensic medical sciences. In these models a decision maker (such as a probation officer or a clinician) has to determine whether to release a prisoner/patient based on the probability of the (unknown) hypothesis variable: “individual violently reoffends after release”. Prior to deciding on release, the decision maker has the option to simulate various interventions to determine whether an individual’s risk of violence can be managed to acceptable levels. Additionally, the decision maker may have the option to gather further information about the individual. It is possible that knowing one or more of these unobserved factors may lead to a different decision about release. the potential amendments in Decision Making, as a result of the expected information gain, ranged from 0% to 86.8% (where an amendment of X% indicates that X% of the initial decisions are expected to have been altered). The key concept of the method is that if we had known that the individual was, for example, a substance misuser, we would have arranged for a suitable treatment; whereas without having information about substance misuse it is impossible to arrange such a treatment and, thus, we risk not treating the individual in the case where he or she is a substance misuser. The method becomes useful for decision makers, not only when decision making is subject to amendments on the basis of some unknown risk factors, but also when it is not. Knowing that a decision outcome is independent of one or more unknown risk factors saves us from seeking information about that particular set of risk factors. 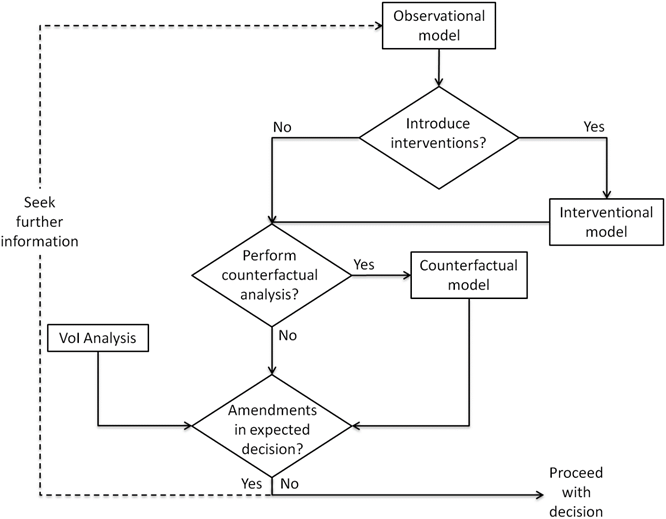 Value of Information analysis for interventional and counterfactual Bayesian networks in forensic medical sciences.